ATP-Autoteile - Autoersatzteile & Zubehör. 90 days right of return. PIERBURG 7.00373.12.0 Intake Manifold. Suitable for all models mentioned in the vehicle list! 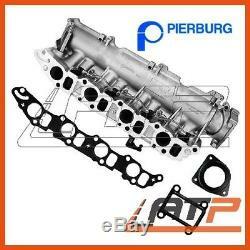 1x PIERBURG 7.00373.12.0 Intake Manifold 3x Gasket (for Cylinder Head, EGR Valve and Throttle Valve). Before purchasing, please check the restrictions in the vehicle list! Intake manifold with swirl flaps Mode of operation: Mechanical Technical information number: SI 0093. The electrical connections should not be established until the intake manifold has been fitted. This will prevent any kind of electrical blockage from occurring. QUALITY PRODUCT - NEW - READY TO FIT. Please note the restrictions on the following vehicle models. 1.9 JTD 16V 937. 10.04 - 03.10. 1.9 JTDM 16V 937. 09.04 - 03.10. 07.04 - 09.05. ALFA ROMEO 156 Sportwagon (932_). 03.05 - 05.06. 1.9 JTD 16V Q4. 07.04 - 05.06. 09.05 - 11.11. 11.03 - 09.10. 09.05 - 11.06. FIAT STILO Multi Wagon (192_). 1.9 D Multijet (192DXT1B). 09.05 - 08.08. OPEL ASTRA H Panel van (L70). 09.04 - 10.10. 08.04 - 10.10. 04.04 - 10.10. OPEL ASTRA H Caravan (L35). OPEL ASTRA H CC (L08). 03.05 - 10.10. OPEL ASTRA H TwinTop (L67). 09.05 - 10.10. 01.06 - 02.15. 09.04 - 02.15. 01.06 - 12.09. VAUXHALL ASTRA Mk V (H) CC. 01.04 - 05.09. VAUXHALL ASTRA Mk V (H) Estate. 08.04 - 03.09. VAUXHALL ASTRA Mk V (H) Sport Hatch. 04.04 - 03.08. VAUXHALL VECTRA Mk II (C). 04.04 - 08.05. VAUXHALL VECTRA Mk II (C) Estate. VAUXHALL VECTRA Mk II (C) GTS. VAUXHALL ZAFIRA Mk II (B). Our service - Your advantage! All items have been quality tested. Almost all of our suppliers have been certified in accordance with DIN EN ISO 9001:2000. See below the exclusion list. We do not deliver to the following postcodes: 971XX, 97133, 97150, 972XX, 973XX, 974XX, 97500, 976XX, 986XX, 987XX, 98799, 988XX (Guadeloupe, Saint Barthélemy, Saint Martin, Martinique, French Guiana, Réunion Island, Saint Pierre and Miquelon, Mayotte, Wallis and Futuna Islands, French Polynesia, Clipperton Island, New Caledonia). Nous ne livrons pas dans les régions avec les codes postaux suivants: 971XX, 97133, 97150, 972XX, 973XX, 974XX, 97500, 976XX, 986XX, 987XX, 98799, 988XX (Guadeloupe, Saint-Barthélemy, Saint-Martin, Martinique, Guyane française, La Réunion, Saint-Pierre-et-Miquelon, Mayotte, Wallis et Futuna, Polynésie française, Île Clipperton, Nouvelle-Calédonie). We do not deliver to the following postcodes: IM (Isle of Man), GG (Guernsey), JE (Jersey). 3559318012 - 3559308012 - 3558880012. Ccf88c8b1 c37370892 c64fd7f8c c7323e6e9 c1a0eb654 c56be8073 c4562d17a cba466b27 cd43fc9e5 ceda3b227 c0bd6de1e c6a3e272e c863da89a cba788c71 c1eb98895 cfaa676c4 c28429b51 cbeb6b95e c875b2e5a c725527a4 c744b347d c69790877 cd66d9cf0 ca119a9e0 c4c652d8b c3021f49c cce5880dd ce96cf7e8 ccaa4d4ac ceab88964 ca5f86eb4 ce34f7dd6 ca12bc46b cc884b05c c432decf2 c47adde5e. Huge product range for all makes. More than 800,000 parts on stock 24/7. Genuine new parts by all renowned manufacturers at the lowest prices. Do you need another item? Discover our huge product range in the.. The item "PIERBURG INTAKE MANIFOLD + GASKETS ALFA ROMEO 147 156 159 GT 1.9" is in sale since Friday, July 14, 2017. This item is in the category "Vehicle Parts & Accessories\Car Parts\Air Intake & Fuel Delivery\Intake Manifolds". The seller is "atp-spareparts" and is located in 92690 Pressath. This item can be shipped to all countries in Europe, Australia.